The purpose of this post is to help you understand the deal analysis math behind the most important house flipping formulas, to ensure that your rehab project is going to be profitable. I’ll talk about the math behind profit, and ROI, how to determine your maximum offer. Additionally, I’ll include some guidance and helpful rules of thumb. On my own deals, on the low end, I aim for a minimum $15,000-$20,000 profit. Any less and you are either working for minimum wage at a high risk job, or in the worst case, you don’t have enough buffer to counter losses from unexpected issues that come up during the rehab. Similarly to Profit, on my own projects I aim for a minimum 15-20% ROI. These rules of thumb ensure that you don’t rationalize yourself into a deal that is either too risky, or where the margins aren’t adequate. Think of ROR as a measure of a deal’s desirability. Whereas ROI helps you determine margins, the ROR helps you evaluate which deal to go after between similar deals. The ROR on the first deal is 81% (20/90*365), and the ROR on the second deal is 61% (30/180*365). That means that even though the ROI for the first deal is significantly lower than the second, your business will grow by an extra 20% for the year, if you choose to go after deals like the first one. The minimum ROR that we look for in our flip deals is 30%. Whenever looking at a property to purchase, in order to make your numbers work, the Maximum Allowable Offer is the offer that you should aim to never exceed. Of course, you should aim to offer and purchase the property for even less than MAO, as it represents the worst case/most that you should offer to make the deal work. To get the maximum allowable offer, you can use either of 2 methods: ROI, or the 70 Percent rule. This rule, often used by novice investors, is a rough approximation of deal viability that doesn’t require ROI math. In many cases the results of this rule fall within the 15%-20% ROI range which is why it works as a good initial framework for deal evaluation. One criticism of the rule is that because it’s not based on ROI it is not as powerful in helping you really understand the deal, and doesn’t give you the ability to measure deals against each other. Nevertheless, it is still a decent guideline to help you understand if you are paying too much. For in-depth explanation of the rule and formula, including example, check out this post on the 70 Percent Rule. 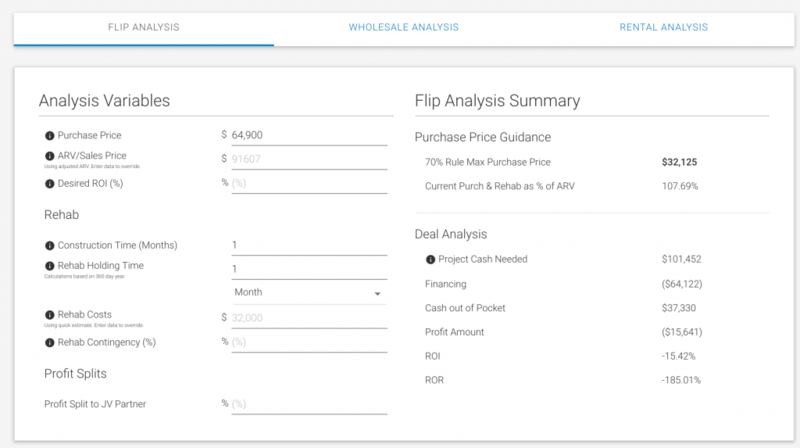 The analysis tab in the REI/kit real estate investment app gives you really easy offer guidance in both ROI and 70% rule terms. Novice investors often forget these two important numbers in their deal risk analysis, and yet the numbers can have a huge impact on deal viability and profitability. You can use these numbers to give you a clue about your holding time risk. The Days On Market (DOM) number for a particular comparable property, lets you know how many days it took to sell the property. This information is useful in a couple ways. From a risk mitigation standpoint, you should look at the average DOM of your comps to understand how long you should expect to hold the property once you list it. This is extremely important to know if you are using Hard Money, have large HOA payments, or if are in high tax areas like Chicago, as it will factor into your entire project holding period. One example of extremely high days on market are seasonal vacation rental or second home areas, such as Palm Springs, where DOM can be up to a year. Using an average of days on market based on your comps you can also get a pretty good idea of how you will need to price the property to ensure a quick sale, which could factor into how much you should purchase the property for in the first place. Days on market information is available on the MLS as well as Redfin. This advanced number related to DOM helps you understand the demand for homes in an area, by showing the rate that inventory gets removed (or absorbed) over time as new inventory gets added. This rate is best applied in the context of your potential deal property characteristics and pricing. You would like to know the absorption rate of, or demand for properties that are similar in features and similar in pricing to your deal. The other useful analysis you can glean from using absorption rates is in looking at whether they are increasing or decreasing over time. This can help you understand whether you will likely be able to benefit from appreciation during your holding period, or whether your projected ARV is too high to ensure a quick sale in a cool market. You will need to get this sale data from the MLS. You can certainly do this with spreadsheets, but this is exactly what REIkit.com was built for.